We spend a third of our lives in bed, and probably more than that in our bedrooms - hanging out, reading... Thus, it goes without saying that our bedroom is a space that needs as much attention to decorating detail as the rest of the house, but often doesn't get it. One way to add instant style is the headboard. 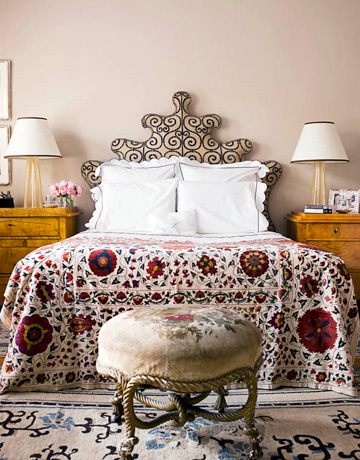 In this bedroom above, Jonathan Berger took inspiration from an 18th century Venetian bed to design this headboard. There are lots of retail options, but for something a bit more unique, let's see what we can find at auction. 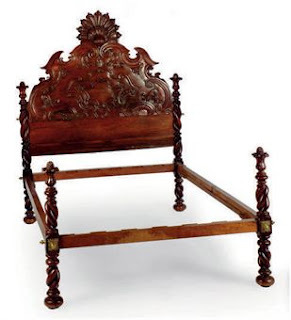 I think this Napolean III tole bedframe has real interest, and is quite unique. It's from the 3rd quarter of the 19th century and has a double headboard. One of the tricky things about buying an antique bed is the size compared to modern mattress dimensions. This bed is 60" wide, so Queen size, but a bit shorter than the standard 80". There are two solutions: 1) just use the headboard, or 2) have a metal craftsman cut the frame and add, in this case, 4" of length. This bed sold for $215, so there might be room in the budget for solution #2. This Continental cast iron daybed would be great in a boy's bedroom. It is 3rd quarter 19th century, and is decorated with animal and foliate designs. It probably could use a good refinishing and a paint job, but would be a really special bed. It sold for $215. This wonderful carved 'Indo-Portuguese' rosewood bed is late 19th century. It's not standard size, so would need either solution 1 or 2 (above). It's 63" wide so would work for a Queen size. 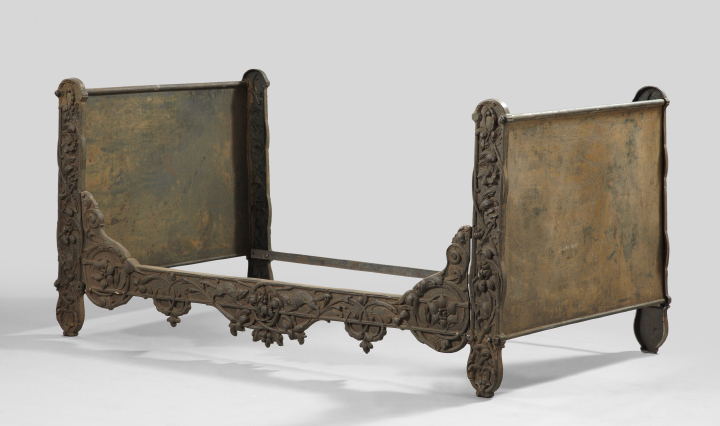 This bed sold at Christie's last month for $3,250, which was well above the auction estimate of $1,000 - $2,000. The headboard is wonderfully detailed and would be a stand out in any bedroom. There are lots of standard bed options at auction (four posters, sleigh beds...), but they are frankly kind of boring and often off sized (and usually quite cheap). I would focus at auction on the unique to make your style statement. Otherwise get something new in a retail furniture shop that will fit the standard mattress offerings. This is exactly what I'm talking about! 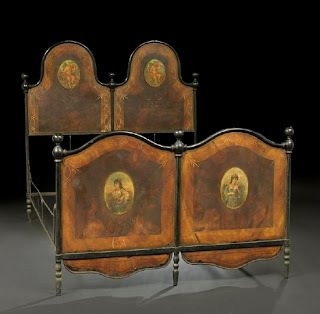 Look at this great 18th century Portuguese headboard in Carlos Miele's bedroom in Florianopolis, Brazil. The carving is fantastic, and is beyond the ordinary. Pile it high with pillows, climb in, and read a good book!